American astronauts will walk on the moon again in the next five years, “by any means necessary,” Vice President Mike Pence declared on Tuesday at a meeting of the National Space Council. “It is the stated policy of this administration and the United States of America to return astronauts to the moon within the next five years,” Mr. Pence said at the U.S. Space and Rocket Center in Huntsville, Ala., on a stage that contained a model of one of the Apollo landing modules that first transported American astronauts to the lunar surface 50 years ago. Mr. Pence described a need for NASA to take on greater urgency in returning to the moon. At the same time, the goal of accelerating that pace has not been reflected in the Trump administration’s NASA budget requests to Congress. 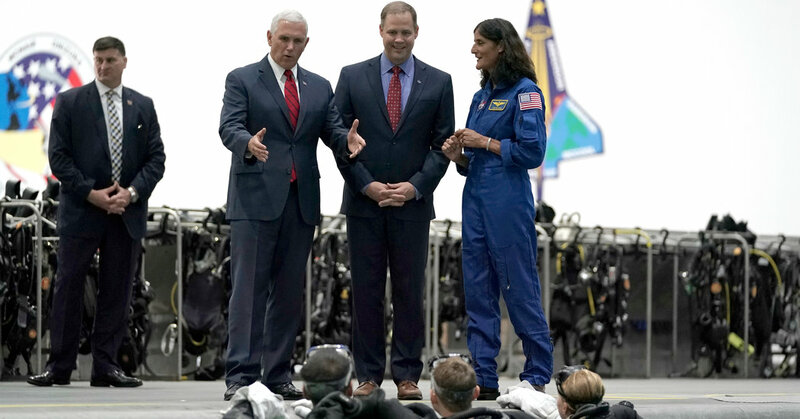 The vice president’s remarks reflected frustration within the administration at repeated delays in the development of NASA’s giant rocket, the Space Launch System, and Orion, a capsule for taking astronauts beyond low-Earth orbit to the moon and possibly, eventually, to Mars. Critics, including Mr. Pence, say that pace is too slow, pointing out that in the 1960s, only eight years elapsed between President John F. Kennedy’s pronouncement in 1961 of a goal of reaching the moon and the landing of Apollo 11 in 1969. Mr. Pence raised the specter of China, which is also looking to land astronauts on the moon in the 2020s, as well as the cost of relying on Russia, which has provided transportation for NASA astronauts to the International Space Station since the retirement of the space shuttles in 2011. Mr. Pence said Jim Bridenstine, the NASA administrator, had developed a plan to get back to the moon, but how this could be accomplished by the end of 2024 is not clear. NASA, for instance, has not started work on a lunar lander nor issued any contracts to commercial companies to work on one. The 1960s Apollo program was given sizable financial resources to achieve its ambitious goals. The NASA budget this year is $21.5 billion, its largest in years. But the Trump administration has proposed trimming that to $21 billion next year and then providing small 1 percent increases after that. Although Mr. Pence lauded the work of the Marshall Space Flight Center, also in Huntsville, which leads NASA’s rocket development, he also made clear that the agency should shift to alternatives if those are quicker and cheaper. “Urgency must be our watchword,” he said.